Rated 4.9 out of 5 based on 27 reviews. 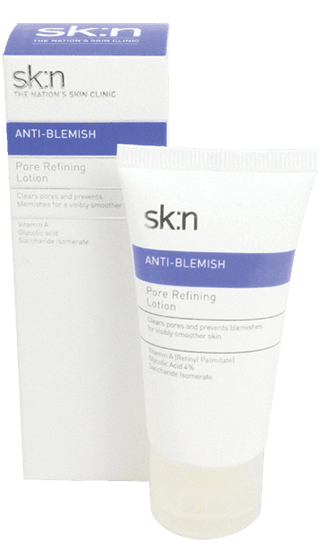 sk:n Pore Refining Lotion clears pores and reduces spots for visibly smoother skin. Vitamin A and glycolic acid remove dead skin cells and help to slow down the over production of cells that block pores and produce spots. 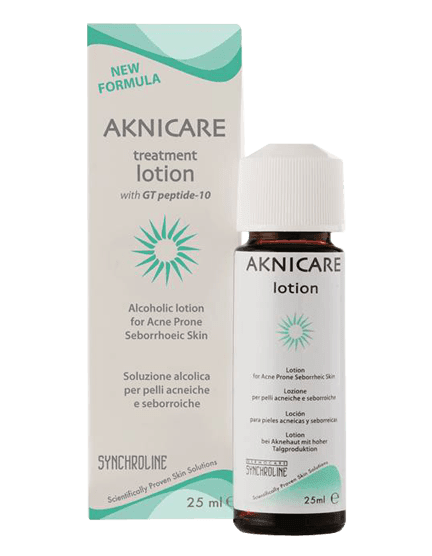 Blemish-prone skin. Suffering from spots, outbreaks and oily blemish-prone skin is common. Acne is a disease of the skin and can cause the sufferer great distress, trauma and anxiety. Under the effects of hormones called androgens, the sebaceous glands increase in volume and secrete more sebum (oil). In addition, cell turnover increases, resulting in thicker skin and blocked pores. The oil that normally lubricates the skin gets trapped in blocked oil ducts. This results in pimples, blackheads, whiteheads, papules and pustules on the surface of the skin and deeper skin lesions called cysts. Vitamin A – a retinol derivative (encapsulated retinol/retinyl palmitate) helps to improve texture, firmness and smoothness of the skin. Vitamin A helps reduce the over production of skin cells that block the pores and trap bacteria and oil, helping to keep skin clear. 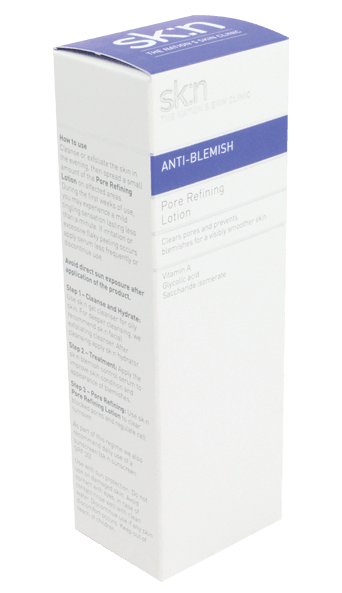 Glycolic Acid – an alpha hydroxy acid with a peeling action to remove dead skin cells, clear pores and improve the overall look and feel of the skin. Saccharide Isomerate – a natural plant-derived active that acts as a highly effective soothing moisturiser. It provides effective hydration for acne-prone skin that tends to become dehydrated from the use of AHAs. Aqua (Water), Glycolic Acid, Coco-Caprylate/Caprate, Caprylic/Capric Triglyceride, Butylene Glycol, Steareth-2, Steareth-21, Glycerin, Sodium Hydroxide, Saccharide Isomerate, Glyceryl Stearate, Cetearyl Alcohol, Cetyl Alcohol, Dimethicone, Lecithin, Microcrystalline Cellulose, Phenoxyethanol, Xanthan Gum, Ethylhexylglycerin, Retinyl Palmitate, Cellulose Gum, Disodium Edta, Retinol, Parfum (Fragrance), Sodium Hyaluronate, Citric Acid, Sodium Citrate, Peg-8, Butylphenyl Methylpropional, Tocopherol, Bht, Ascorbyl Palmitate, Coumarin, Ascorbic Acid. Cleanse: with sk:n Vitamin Rich Gel Cleanser for Oily Skin or with sk:n Facial Exfoliating Cleanser for deeper cleansing. Both can be used morning and evening. 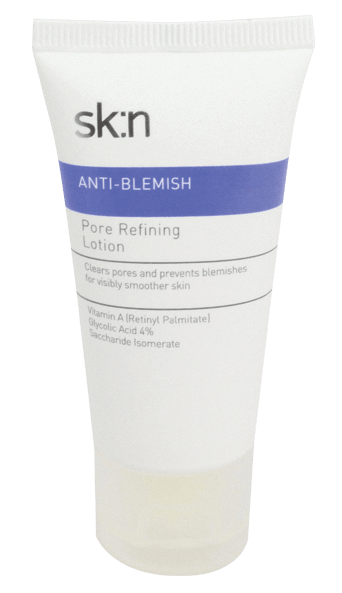 Hydrate: with sk:n Hydrator for oily / acne-prone skin after cleansing. 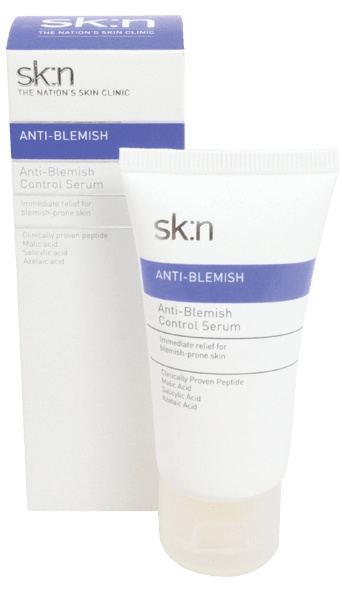 Treatment: with sk:n Anti-blemish Control Lotion when spots are inflamed. Maintenance: evening application of sk:n Pore Refining Lotion to clear blocked pores and help regulate cell turnover. Protect: morning application of sk:n Sunscreen SPF 30 to protect the skin from harmful UV rays. I apply this lotion every night over the anti-blemish hydrator. It’s so smooth and creamy without being too rich. 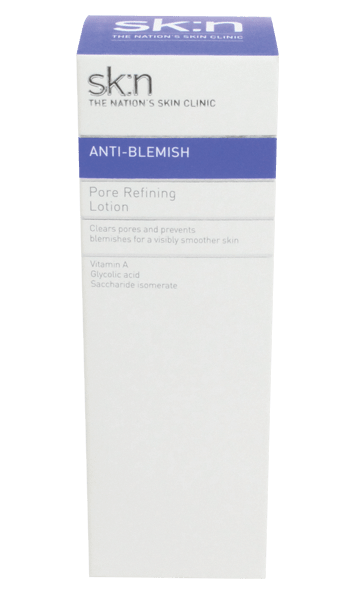 It keeps my pores looking so clear and clears up blemishes within a day or so! I couldn’t be without it. Good product, does what it says it does. It contains Vitamin A, 4% Glycolic Acid and Saccharide isomerate so the ingredient are prevent my sensitive skin from breaking out. Bottle is a bit small but a good product so worth it. Its like silk. Definitely a must have as part of your spot care routine. Your order should arrive with you within five working days of placing it with us. The charge for delivery is £3.95 per order. Currently, we only deliver to Great Britain and Northern Ireland. Products can only be returned if they are unused products, in their original condition and include both their inner and outer packaging where applicable and must be returned within 28 days. We offer refunds or replacements on presentation of your receipt. Unfortunately, we’re not able to exchange products. If the product you received is faulty, we’re happy to refund or replace the item, even when used. We do not cover the cost of returning the goods to us.